Members of FLL Team #2774 JFK Trash Bandits of Terryville, New York accept the Champion’s Award at the SBPLI FIRST® LEGO® League Championship Tournament, which was held at Longwood High School on Sunday, February 28. Longwood High School was once again home to the School-Business Partnerships of Long Island, Inc. (SBPLI) FIRST® (For Inspiration and Recognition of Science and Technology) LEGO League (FLL) Long Island Championship Tournament, which took place at the school on Sunday, February 28. The event challenged 400 Long Island middle school children to demonstrate their problem-solving skills, creative thinking, teamwork, competitive play, sportsmanship and sense of community. FLL Team #2774, the JFK Trash Bandits of Terryville, took home the First Place Champion’s Award and will continue on to the FLL World Festival, which will be held at the Edward Jones Dome in St. Louis, April 27 to 30, 2016. FLL Team #6435, the GearHeadz of Rocky Point, secured the Second Place Champion’s Award and will advance to the FLL Open Championship being held at LEGOLAND in Carlsbad, California in May 2016. After eight weeks of research and design, 150 teams competed in four Qualifiers for an opportunity to be one of 40 teams to participate in the Championship Tournament at Longwood High School. The theme of this year’s competition was TRASH TREK℠, which tasked the more than 230,000 students from nearly 80 countries around the world with discovering the hidden (or not-so-hidden) world of trash. Teams had to program their LEGO MINDSTORMS® robots to solve a number of missions on an obstacle course set on a thematic playing surface. Game missions include demolishing a building and salvaging valuable materials from the debris, converting organic material into fertilizer and reusing methane produced in a landfill to power a truck and/or factory. The FLL competition is judged in three areas: project presentation; overall robot performance, design and programming; and teamwork, with a consideration of the FLL Core Values. The highest honor went to the team that best succeeds in these areas and exemplifies the spirit and values of the program. Prior to competing in the FLL Championships, the aforementioned teams participated in one of four Qualifiers, held in January and February at Mineola and Central Islip High Schools. ***Photo of all award winners are available upon request. ****Descriptions of the awards are available upon request. School-Business Partnerships of Long Island, Inc. (SBPLI) was founded in 1984 by Fred Breithut with the goal of developing partnerships between local high schools and businesses that would provide students with practical experience and curriculum development, while helping the business community develop its future workforce. Over 100 partnerships have been formed. In 1999, SBPLI brought the FIRST (For Inspiration and Recognition of Science and Technology) Robotics Competition to Long Island, in which eight high school teams participated. Since then, the Long Island Regional FIRST Robotics Competition has grown to 50 teams competing each year. 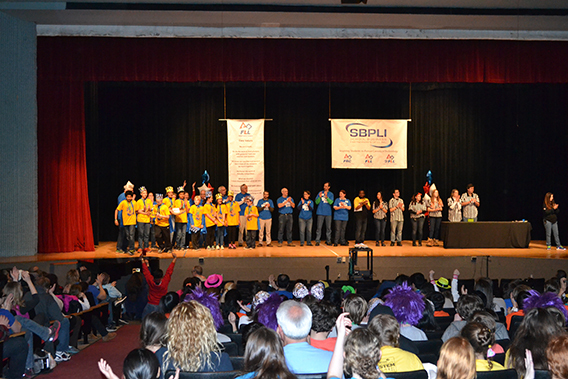 SBPLI also hosts Long Island’s annual FIRST LEGO League Qualifying and Championship Tournaments and the Junior FIRST LEGO League Expos, in which more than 2,000 elementary and middle school students from Nassau and Suffolk Counties take part each year. For more information, visit www.sbpli.org. Accomplished inventor Dean Kamen founded FIRST® (For Inspiration and Recognition of Science and Technology) in 1989 to inspire an appreciation of science and technology in young people. Based in Manchester, N.H., FIRST designs accessible, innovative programs to build self-confidence, knowledge, and life skills while motivating young people to pursue opportunities in science, technology, and engineering. With support from over 200 of the Fortune 500 companies and more than $22 million in college scholarships, the not-for-profit organization hosts the FIRST® Robotics Competition (FRC® ) for students in Grades 9-12; FIRST® Tech Challenge (FTC® ) for Grades 7-12; FIRST® LEGO® League (FLL® ) for Grades 4-8; and Junior FIRST® LEGO® League (Jr.FLL®) for Grades K-3. Gracious Professionalism® is a way of doing things that encourages high-quality work, emphasizes the value of others, and respects individuals and the community. To learn more about FIRST, go to www.usfirst.org. The LEGO Group is a privately held company based in Billund, Denmark. The company is still owned by the Kirk Kristiansen family who founded it in 1932. The LEGO Group is engaged in the development of children's creativity through playing and learning. Based on the world-famous LEGO® brick, the company today provides toys, experiences and teaching materials for children in more than 130 countries. For more information, visit www.LEGO.com.